In 1929 Rhyl held a Carnival which turned out to be one of the biggest events ever to be held in the town. Ten of thousands of people flocked into Rhyl by road and rail for the three day Carnival which began on Thursday, June 27th. The advertisement on the left is typical and was from the Yorkshire Evening Post. The sun shone on the Carnival’s opening day, the highlight of which was the arrival of the famous aviator Sir Alan Cobham, but more of that later. Also on the Thursday was a Gilbert and Sullivan garden fete in the Vicarage Grounds and a torchlight procession and tattoo in the Marine Gardens (beside the pavilion). But back to the opening day and the hugely anticipated arrival of Sir Alan Cobham in his de Havilland Giant Moth which he christened “Youth of Britain”. The Rhyl Journal reported that he was expected to arrive at Aberkinsey Farm (between Rhyl and Dyserth) at 11a.m and a big crowd had gathered to welcome him. Unfortunately he experienced mechanical problems as he left Crewe which meant it was after 12 noon that he was first sighted over the farm. He made a “beautiful” landing amidst great cheering and was immediately “mobbed” by the crowd. Sir Alan then proceeded to take members and officials of Rhyl council for a flight over the town. Then a second party boarded the plane but as it took off the propeller caught a tree and sustained damage which caused abandonment of the flight. Fortunately no-one suffered any injuries. A photograph of the “crash” can be seen below. The Rhyl Journal published a list of children chosen to take a flight that day, representing various schools in Rhyl. It added that their flight would be postponed until the following day because of the accident. It was not clear in the paper as to whether the children ever took their flight – risk assessment was probably quite different in 1929! In true “Antiques Roadshow” style we have been given a bag of cine films that was bought in a car boot sale. Many of them have uninspiring titles such as “Christmas 1967”, but one was entitled “Marine Lake”. When we had this film digitised we saw a film that seems to have been taken from the Ocean Beach, looking towards the Pleasure Beach. It appears to show the demolition and burning of the roller coaster “The Figure of Eight”. Please comment if you can name the year, remember the Figure of Eight or have any other information. If anyone knows the provenance of the films, who we should credit etc., please contact Rhyl History Club. The baths in Sussex Street opened in 1905, they were situated where the old market used to be – where Peacock’s is today. They closed in 1939 in order for the building to be used as a supply depot during WW2. We don’t think it opened again after the war but if you know differently please comment below. 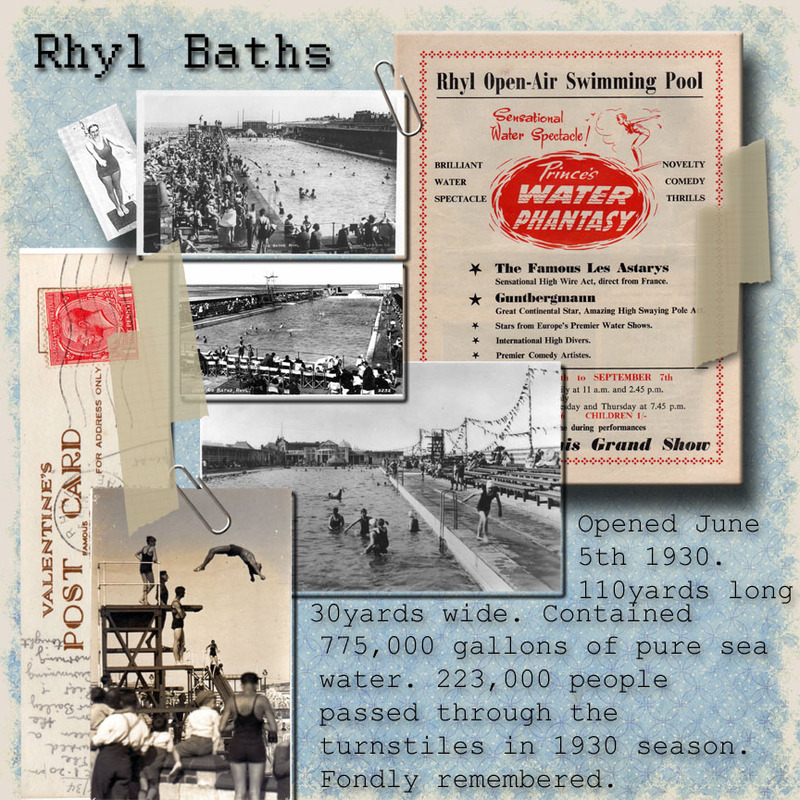 The wonderful Rhyl Outdoors Baths opened in 1930 but of course these were closed in the Winter. The Sussex Street Baths were the enterprise of a gentleman from Walsall – Mr Huxley. Whilst the building itself was not exceptional, there was praise for the facilities within. The swimming bath was described in the Rhyl Journal as being “of full racing size”. It was 75′ long and 30′ wide (23mx9m). The depth was 6’6″ (2m)at the plunge end and 3’3″ (1m) at the other. It was fitted up with apparatus for polo, chute, trapeze, diving stage and climbing ropes for developing the muscles. A balcony for spectators ran all the way around. The pool was constantly supplied with water direct from the sea, “powerful machinery being employed for that purpose”. The water was heated and kept at around 75° F (24°C) by a huge boiler. The Journal reported that there were also private baths including “electric baths, vapour baths, Russian Baths and ordinary hot and cold sea baths”. There was also full hydropathic treatment available. The formal opening of the baths took place on Friday, June 16th 1905, and the great and the good of Rhyl were in attendance. Mr J.W. Jones, Chairman of the Council opened the door with a silver key and then addressed the assembled guests from the balcony overlooking the baths. In concluding his address he wished the undertaking every success and added “as a result of the facilities there afforded they would have in Rhyl a community not only of proficient swimmers, but of youth and manhood made physically and morally strong”. The High Sheriff of Flintshire then spoke, followed by Dr. A. Eyton Lloyd (Medical Officer of Health) who extolled the virtues of swimming for health and fitness. It would be nearly 50 years before Sir Richard Doll discovered the link between smoking and lung cancer, but Dr. Eyton Lloyd said those who smoked “were diminishing their physical reserve” and appealed to young people to “do themselves justice and smoke less and swim more”. It’s that time of year again – the very popular Rhyl Air Show is now in its eighth year and is taking place this weekend, August 27th and 28th. It has brought to mind a favourite photograph from our archive of an aeroplane at Kinmel Bay. (pictured right). In the mid 1930’s Kinmel Bay Air Services sold flights from the beach. A local man who remembers the flights says they cost “about 2 bob or half a crown” (approx. £8 in today’s money). photo credit: with kind permission of Fonthill Media Limited. The AVRO 504K (left) began life as E9353 with the RAF, and received its first C of A (Certificate of Airworthiness) and registration G-ABWK in June 1932. It was operated for a while by the Essex flying Club at Abridge before it passed to Kinmel Bay Air Services. For a while it flew holiday makers from the beach at Rhyl. The picture shows it returning from such a flight on September 1st, 1934. In 1935 it was sold abroad. The AVRO 504K G-EBYW, right, is pictured on the same day in Rhyl/Kinmel Bay. It was initially registered to Surrey Flying Service in September 1928 and based at Croydon. After service with Kinmel Bay Air Services the aircraft passed to local man Edward Clerk in 1934, but was not flown after its C of A expired in June of the following year. If anyone has any information about “Kinmel Bay Air Services” or any memories of flights from the beach, we’d love to hear from you. Whenever Rhyl History Club show a photograph of the basket chairs on the beach we always hear a collective “Aaah”. This is soon followed by stories, reminiscenses in some cases, of how they were pushed together by courting couples who wanted some privacy, don’t ask. What isn’t so often commented upon is what a great idea they were for use on our often breezy (windy!) beach. Positioned correctly they would have provided great shelter from the elements. Note the bathing huts on the shoreline. Also, the very formal clothes and that everyone seem to be wearing their hats! Some of our readers will remember the sandhills alongside the East Parade and Marine Drive. Wilt thou insert these few lines. The woman of the house where I soujourn at the present in Rhyl told me that it is the intention of the local authority to turn the sandhills beyond the hospital into a promenade. That, I verily believe, would be a pity. They are pleasant places and I, and possibly many others, prefer srolling and sitting among the hills to the hard, dry and crowded “promenade”. Please try to persuade thy friends and fellow townsmen to preserve for our use the nice sandhills. Click to follow Rhyl History Club.